When you have an electrical problem in your home or business, there are many benefits to choosing an electrician local to the Oklahoma City, OK area. 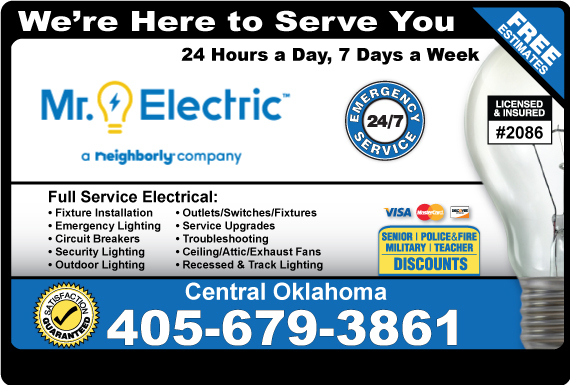 In addition to supporting a member of your Oklahoma City community, you are also choosing an electrician that can get to your home and solve your electrical problem faster than an electrician outside of the Oklahoma City, OK area. By hiring a licensed and reputable Oklahoma City electrician, you can ensure that your electrical problem will be taken care of in the most professional manner possible. And finding a good, experienced Oklahoma City electrician will give you the comfort of knowing that if you should have another electrical problem in the future, your local electrician is right around the corner.